AGAIN FOR VIEWING THE WAY IT WAS INTENDED. Trading View's platform scrunches up the cover chart and have to paste it again in comments. Do NOT assume we will fall into months of bear trend in Phase E as depicted on the image of Wyckoff Distribution Schematic #1 above. 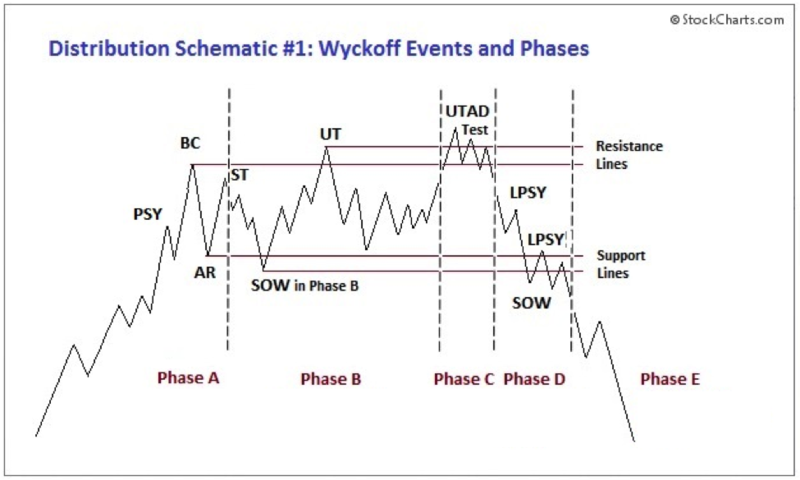 Even Wyckoff himself said we do not have to fall into Phase E if the laws of Supply and Demand determine we should skip it and fall into another Phase A of a new schematic. Following up later with more charts including indicators. 評論: 4-Day TF (Each candle is a period of 4-Days - for new comers). 評論: I'm updating this publication with more detailed price points to collocate (be in harmony with) last year in regards to WHEN we peaked and bottomed out on specific dates. We still do not have enough history on ETHUSD in order for me to use Loaded Guns Theory rules to determine 0.618 FIB RT at bottom of MAJOR consolidation events or the 1.618 FIB at the peak of MAJOR Up Thrust events. We will have a better idea of those price points with those rules the next following year (2019). 評論: One IMPORTANT thing to consider with our TA (Technical Analysis) for ETHUSD. That "thing" happens to be EOS Blockchain. This is where we get into some FUNDAMENTAL analysis (FA). What relevance does EOS Blockchain have to ETH Blockchain? EOS was an ICO funded via an ERC token on the ETH Blockchain. EOS has hundreds of millions of dollars worth of ETH it received for its funding and development. If those hundreds of millions were to be dumped in order to suppress the value of ETH "while" using the capital it receives from dumping ETH to "pump" EOS, that could dramatically affect this analysis. There are several other coins that may join in and do the same. It's hard to say at this point but it's definitely worth taking into consideration when trading ETH. If ANYONE knows when EOS Blockchain goes LIVE, "please" share this info with the rest of the community following this "idea." 評論: utechs, was kind to share the date the EOS Blockchain goes LIVE in the comments section below. He said it was scheduled for June 3rd. "Oh WOW... Thanks for sharing that, Brother. Much appreciated. As you and I know, end of May/early June is the time range in which we reach the peek of our Spring/Up Thrust event and begin a MAJOR consolidation down. That date in which the EOS Blockchain goes LIVE could very well mean the consolidation event may drop much lower than anticipated. I'm referring to the bottom I have July 14th at $770. It may very well go MUCH lower than this. " This might be a very volatile year for ETH. Which means we must stay on our toes. 評論: Apologies for not being around yesterday to provide signals. I had a full day yesterday with the power company replacing transformer and electricians upgrading my inside with new panels to upgrade from 200 Amps to 400 Amps. Today, I MUST install 8 new 30 amp circuits for rigs and 4 new 20 amp circuits for fans to keep the rigs cool and for my network/router/switches. I will also be involved with my nephews wedding Friday through Sunday. So, I won't be posting much at all the next few days. Here's a brief mid range TF with the 240m (4h) and 360m (6h) TF's. 評論: Pardon so many email notifications you're probably getting at the moment with these updates. I simply wanted to point out the Magenta RSX (Relative Strength Index); which would be VERY similar to your Red line in Godmode 3.1 Mod with LSMA indicator; did dip down quite low in both the 240m and 360m TF's. So, the possibility is a little higher than normal of a reversal back to the upside now without the Blue LSMA actually coming down to the 20% level before seeing a reversal. The only time this usually occurs is during a long term market trend; which is the case now. The only other thing I can come up with is the Magenta RSX is showing the beginning plot for an A,B,C wedge building up like a coil (as it gets narrower at the point) before we actually build up enough energy in that coil to rocket upside once again. 評論: My bad... I see I accidentally posted an ETHUSD update in this publication. Shows evidence of how exhausted I was when posting that. About to get back to work in the server room. Anyway, here's a look at the 60m TF. Thought I would go that low for "kicks"
評論: $686.00 more than likely target at the 0.618 FIB. 評論: I've been working and will continue to work in my mining room. My electrician is still waiting for the Power Company to tell him when they can come out to disconnect power (hopefully one last time) in order to "replace" the old meter can with a new one that is not leaning and has the proper number of threads going inside the box. 評論: Especially, when the Blue LSMA gets below 20% level like that... Got to take advantage of those when you possibly can. Unfortunately, I do not currently have the time to take advantage of such moves. 評論: 2-Day TF: What I'm seeing with ETHUSD appears to possibly support what I'm seeing in BTCUSD. That's "if" ETHUSD runs pretty much in sink with BTCUSD. 評論: The last post made was with the 2-Day TF. I made a comment it would take 2 to 4 days for the Stochastic RSI to come down to the 0.0% level. The fourth day ends midnight Sunday, May 20, 2018 (Today) before Monday Morning. Here is the progress with that 2-Day TF. Keep in mind, this first chart still has the same text bubble for Stochastic RSI and Phoenix ARI merged. So, do not assume I'm saying we have another 2 to 4 days before the Stochastic RSI reaches the 0.0% level. June 3rd EOS blockchain goes live. Oh WOW... Thanks for sharing that, Brother. Much appreciated. As you and I know, end of May/early June is the time range in which we reach the peek of our Spring/Up Thrust event and begin a MAJOR consolidation down. That date in which the EOS Blockchain goes LIVE could very well mean the consolidation event may drop much lower than anticipated. I'm referring to the bottom I have July 14th at $770. It may very well go MUCH lower than this. Thanks again for the info. I'm going to share it now with other followers in a post above. Which means you'll get an email notification for ETH but it simply means I'm copying and pasting my comment and yours. Sir, what is the point , where u memtioned back to phase A by skipping phase E? U mean start of redistribution? Normally wyckoffians would wait for the sow/ mark down to appear to enter sureshot short.. But this becomes a problem if another phase a starts, how to handlle that..? Normally, a phase E of distribution implies a year or more of bear trend. However, I've found this only to occur one time with Bitcoin. That was pretty much all of 2014. Phase E can be "rejected" (Due to Demand over coming supply) and we revert to Accumulation. The main reason for this entire year is depicted as a Distribution Schematic is because of the 70+ percent drop we had the beginning of this year. This compelled me to change my thoughts for the entire year playing out in the form of a Distribution Schematic (Beginning with phase A) on till the end of the year with Phase C. Phase D will begin the start of 2019 and we will see if we fall into a phase E in 2019 for almost the entire year OR if we reject Phase E and fall into Phase A of either Accumulation or Distribution Schematic. Back in the days of Wycoff, they did not have all the indicators and the internet like we do today. I use indicators along with Wyckoff to TRY to get an idea of what's about to occur ahead of time in order to place my bets accordingly at opportune times (whether buy or exit in crypto OR short or long in stocks/currencies (FOREX). 4-Day TF with indicator is above in my publication. Thanks for your work! Amazing material, as always! Any thoughts on XMR and\or alts in general? I suppose most of them will follow ETH \ BTC pattern if your chart actually plays out like that. I'll do one on XMR/USDT Poloniex as well some time later today. Yes, it will be somewhat similar to my BTCUSD BitStamp and ETHUSDT Poloniex publications. Thanks for the follow and the "like."